Answer: Yes indeed, a yearly celestial event known as the Winter Solstice occurred just yesterday. No worries that you’re reading my response a day late, as you didn’t really miss much. In fact, what can be seen lasts for a few days before and after the exact date of the Solstice. Whether you’ll see anything “special” depends on how careful an observer you are. You’ll probably hear about the Solstice from your favorite weather person, since it’s officially considered to be the first day of Winter, but their explanation is typically over-simplified (and sometimes incorrect). If you are a careful observer, you’ve no doubt noticed how the Sun rises and sets at different points along the horizon throughout the course of a year. The Winter Solstice happens when the Sun reaches its extreme south rising and setting points. At the Summer Solstice, it’s the extreme north points. The path the Sun appears to take through the sky shifts slowly from season to season. This shift causes the sunrise and sunset points to drift north and south along the horizon. We all learned in school how “the Sun rises in the east and sets in the west.” That’s only approximately true. 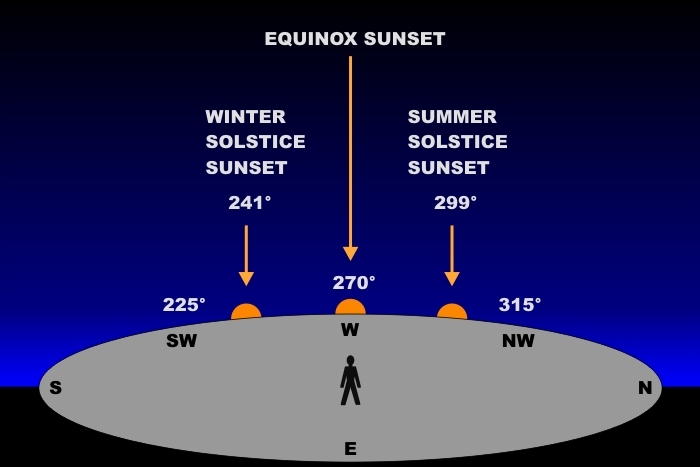 West is 270° on the compass, but the Sun only sets at 270° on the Spring and Fall Equinoxes. At other times it sets north or south of true west. Same with sunrise at 90° in the east. How much north or south depends on the date, and on your latitude. But wherever you are*, the Winter Solstice marks the extreme southern excursion of the sunset point. In Arizona, or anywhere else around latitude 34° N, that point is near a compass heading of 241°, a direction better described as WSW (west by southwest). This is also our shortest day of the year, with only 9 hr 45 min of daylight. By comparison, on the Summer Solstice, the Sun sets near 299°. On that date we Arizonans “enjoy” our longest day of the year, with 14 hr 23 min of daylight. The word solstice comes from the Latin: Sol = Sun and sistere = “to stand still.” The Sun doesn’t actually “stand still” on a solstice, but the north/south shift of its path through the sky appears to halt for a few days. The shift of the Sun’s path is most gradual near the solstices, and most rapid near the equinoxes. On December 22nd the Sun will set (and rise) slightly farther north, beginning its next annual cycle. The Sun will take a higher path through the sky. Days will lengthen, and temperatures will increase (eventually — there’s a few months lag between daylight hours and climate). Half a year later, Summer, as always, will arrive on schedule. *Things get a little more complicated near the poles, but that’s a topic for a future post.